While many people venture to Hunt Valley each year for their quota of competitive tournament play, a growing number of BPA members are using their time in often equally competitive unofficial fare - Open Gaming. Tables set up for the express purpose of allowing attendees to congregate for ad hoc gaming have always been a cornerstone of WBC, but in recent years, the trend to spend more time sampling non-tournament items has grown significantly. The objective observer will see a goodly number of wargames in the "assembly areas" designated for Open Gaming. GMT's more recent offerings are often tested by eager buyers in this non-tournament arena. Expect the new releases to get their first baptism of fire in Open Gaming on their way to a Century appearance next year. You will also find Decision Game's display in the corner of the Valley Assembly area. Decision is the show's designated all purpose vendor - on call throughout WBC to sell you whatever game you have a hankerin' for before the other vendors setup shop on Friday. Later in the evenings, one finds some less-intensive games at these tables. In fact, party games Celebrities, What Were You Thinking, Beyond Balderdash, Oodles, and other traditional 'parlor games' were again regulars, and were well-accepted by the teenage crowd. Heavier social games like Junta and Shanghi Trader were often seen, as these games can be played with a bit of whimsy. TSR's old social wargame Divine Right was even spotted amongst the impromptu gaming. Also seen late in the evening were recreations of earlier losses in tournament games ranging from Battle of the Bulge to Acquire to Settlers of Catan. And lately, all night sessions of Were Wolf dominate the wee morning hours. But the bulk of the non-tournament gaming rests in the area of "strategic family games." Some refer to these as "German or Euro games," even though many of them are designed and produced right here in the U.S. 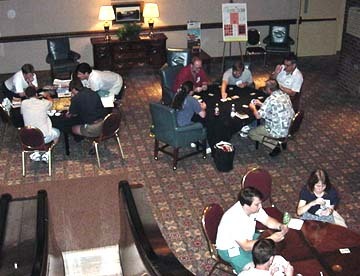 Nonetheless, with the advent of Jay Tummelson's Rio Grande Games demonstration tables in Cafe Jay, this segment of the boardgaming hobby has exploded onto the WBC scene. With Jay's cheery come-on of "Hey! Wanna play a game," more and more convention-goers have become exposed to these challenging jewels. Where else can you learn a new game and win a free milkshake at the same time? In the process, he has provided us with more Open Gaming tables than ever before. Where? Please limit your Open Gaming to the Maryland and Hunt Valley Assemblies (hallways) and Cafe Jay. Don't make us inconvenience you by forcing you to move a game in progress to make room for a scheduled event. Two-player games should use the green portion of the Valley Assembly on the map at right whereas Multi-Player games should use the red area of the Valley Assembly downstairs plus the Maryland Assembly upstairs. Occasionally, an event room will appear empty or with sufficient room to tempt you to play there. Always check the door signs outside each room for incoming events scheduled for that room before setting up in one of them. If another event is scheduled to start there before you will finish, do not attempt it because we WILL force you to move - and neither you nor we want that to happen. When? The advent of the three dedicated mini-con Pre-Cons to WBC week the preceding Saturday-Sunday-Monday-Tuesday have tempted some to arrive even earlier for Open Gaming opportunities. While we wish we could accomodate those wishes, we simply do not have the space. WBC does not officially commence until 6 PM Tuesday. The available meeting space is usually already committed to other groups who have paid for that space. Consequently, there may not be any such space available. Due to the presence of another conference there is absolutely no extra space the preceding Saturday and Sunday. There may be some space on Monday and things will open up somewhat on Tuesday as Hunt Valley Inn prepares rooms for our use, but we simply cannot guarantee any Open Gaming space prior to the opening of WBC. So be forewarned - if arriving early and open gaming is your agenda - be prepared to play in your guest room. Requirements: We recognize that Open Gaming is an important part of the gaming conference for many and attempt to provide it in ample amounts with 24-hour Open Gaming space.WBC and its predecessor offered free Open Gaming for nine years. This enlightened approach was intended to promote the hobby in the hope that those who freely sampled the conference one year would come back the next as participants. Sady, the same people came back year after year without paying anything towards the convention's costs. Free Open Gaming was also a financial disincentive which discouraged, rather than encouraged, participation in the tournaments which is our major raison d'etre. Consequently, we now require ALL adults who play at WBC to pay their fair share. We realize there are those who feel Open Gaming should be free. However, a free Open Gaming policy would be unfair to the majority who support the conference with their membership and thus pay all the freight for those who do not. WBC, unlike many conventions, allows free spectators and visits to the vendor displays. However, we ask every member to support the Members Only playing policy. Those who do not display their badge in Open Gaming will be asked to leave. Tables and chairs are in short supply and must be reserved for the members who have paid for them - not to mention the facility itself and the many associated costs of hosting such a conference. WBC has more Open Gaming space than ever before. You can help continue Open Gaming at WBC by always wearing your badge and refusing to play those who do not. Do not carry your badge in your pocket or leave it in your room. Get in the habit of always wearing it. This will keep our security patrols from needing to bother you to check your badge. Lost badges will not be freely replaced. WARNING: Do not use our tables as a place to park your belongings. The tables are reserved for paying guests to play games ... not to setup semi-permanent displays. Games left unattended will be removed to Lost & Found. Absolutely no unauthorized exhibit or sale of materials of any kind is permitted. No coolers are allowed in the meeting rooms or Open Gaming areas. You are free to distribute gaming related flyers at the conference. We suggest you leave them at the registration desk. However, adhering any type of message or poster to the walls or furniture is prohibited. Such signs will be destroyed at once and if the practice persists the person(s) placing such posters will be evicted without refund.